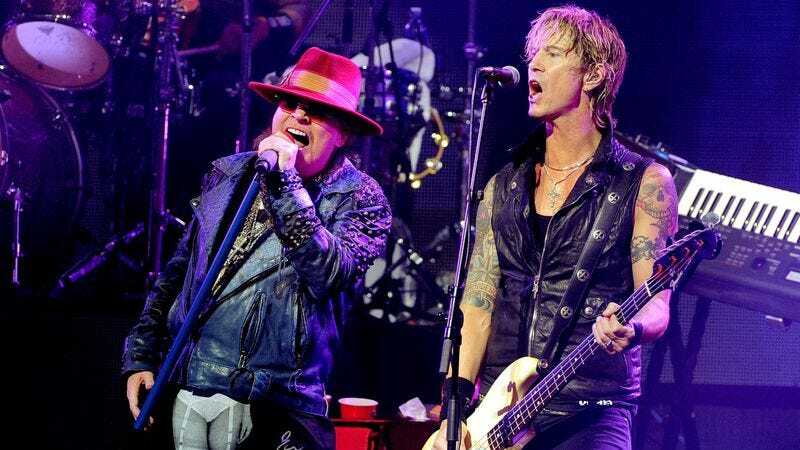 After months of teases, rumors, and in-depth discussions about who would—Axl Rose, Duff McKagan, and Slash—and would not—Izzy Stradlin—be participating, Guns N’ Roses has finally released the official dates for its 2016 reunion tour. Besides its headlining appearance at Coachella, and the long-expected Las Vegas shows with Alice In Chains, the band has planned out 20 stops for the tour, ensuring that people all around the U.S. can partake of this grand national parade of top hats, ratty bandannas, and poorly-weathered nostalgia. The shows will kick off with a June set in Detroit, before proceeding to bounce all over the place, not unlike an aging rock star trying to nail the vocals in “Sweet Child Of Mine.” Stops along the way include Chicago, Washington D.C., and San Diego, where GNR will wrap things up in August, long before the fabled rains of November can wash the last of the band’s lingering goodwill well and truly away.